Long story short: The children were excited but I was probably more excited than them during the “Programming and creativity using Scratch” workshop series that took place at Koninklijk Atheneum Antwerpen as part of the TEDxYouth@Flanders 2012. Both the morning and the afternoon sessions went very well, and it was a unique experience exploring the fundamentals of computational thinking with children while helping them take their first steps into programming using Scratch. 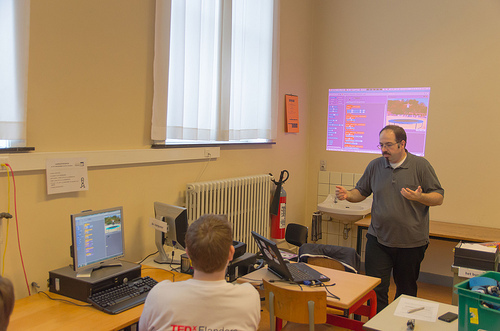 After this event, I have decied to publish my “Scratch Workshop Agenda” document under a Creative Commons license so that other people who would like to organize similar events could be able to take this as a starting point. It is also very nice to see that the previous version of this document had been used at the Devoxx4Kids events (held in Dutch and then French). 48 kids are going to get their hands dirty, soldering, tinkering, hacking, and composing. A series of hands-on workshops led by world-class Mentors will introduce the kids to a range of skills and methods. Meanwhile, grown-ups will be treated to an all day program of leading thinkers and experts. Our line-up of speakers includes: Mark Frauenfelder (MAKE Magazine), Cory Doctorow (BoingBoing.net), Tan Le (Emotiv), and Gever Tulley (Tinkering School) among others. The world premier of TEDx Kids@Brussels will be taking place on June 1, 2011 at St John’s International School in Waterloo, Belgium.